SPRING VALLEY, Minn.—The 18th Annual Featherlite Fall Jamboree gets underway one week from today at the Deer Creek Speedway in Spring Valley, Minn., where Modified drivers will be racing for $5,000 to win the first two nights and a $10,000 paycheck on Saturday. Set for Thursday-Sunday, Sept. 22-24, fans will witness a complete program all three nights. 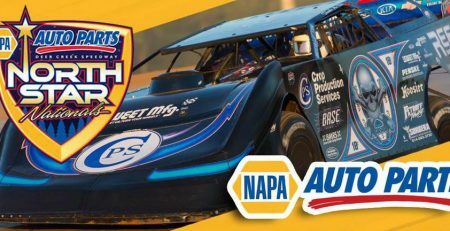 On Thursday, the United States Modified Touring Series competes in the final points race of the year with the final event in the Hunt for the USMTS Casey’s Cup powered by S&S Fishing & Rental and the crowning of the 2016 USMTS National Champion. The annual Non-Qualifiers Race will dole out $2,000 to the winner prior to Saturday’s championship race which will start a minimum of 30 cars three-wide while the Non-Qualifiers Race will also have 30 cars on the track. Friday and Saturday’s shows will be co-sanctioned by the United States Racing Association with valuable USRA national points on the line. The Iron Man Series featuring Out-Pace USRA B-Mods will share the spotlight all three nights. If witnessing the best-of-the-best and who’s-who of dirt modified racing circling the high-banked Deer Creek Speedway clay oval at nearly 100 mph, this event is for you. Early bird race fans can get a free preview of the action and drivers will get their chance to make final adjustments to their machines with an open practice from 6-9 p.m. on Wednesday, Sept. 21. Defending USMTS national champion Jason Hughes leads Cade Dillard by a mere 10 points entering the finale for the Hunt on Thursday while two-time USMTS national champ Rodney Sanders is 49 markers out of first place with an outside chance of scoring his third USMTS crown. Last year, Hughes came into the Featherlite Fall Jamboree in a dead heat with Sanders for the title and wound up sweeping all three nights of event. On Saturday, the top 30 finishers in the Modified “B” Mains not advancing to the “A” Main will compete in the Non-Qualifiers Race with a complete redraw for starting spots. Thursday’s “A” Main – 1. $5000, 2. $2500, 3. $1800, 4. $1300, 5. $1000, 6. $850, 7. $775, 8. $700, 9. $650, 10. $600, 11. $575, 12. $550, 13. $525, 14. $500, 15. $450, 16. $425, 17. $400, 18. $350, 19. $340, 20. $330, 21. $325, 22. $320, 23. $315, 24. $310, 25. $305, 26-30. $300; Tow $50. Friday’s “A” Main – 1. $5000, 2. $3000, 3. $2000, 4. $1500, 5. $1000, 6. $900, 7. $800, 8. $750, 9. $700, 10. $650, 11. $625, 12. $600, 13. $575, 14. $550, 15. $525, 16. $500, 17. $475, 18. $450, 19. $425, 20. $400, 21. $375, 22-30. $350; Tow $50. Saturday’s “A” Main – 1. $10,000, 2. $5000, 3. $4000, 4. $3300, 5. $2700, 6. $2200, 7. $2000, 8. $1700, 9. $1500, 10. $1300, 11. $1200, 12. $1100, 13. $1000, 14. $900, 15. $850, 16. $800, 17. $775, 18. $750, 19. $725, 20. $700, 21. $675, 22. $650, 23. $625, 24-30. $600. Saturday’s Non-Qualifiers Race – 1. $2000, 2. $1500, 3. $1000, 4. $800, 5. $700, 6. $600, 7. $500, 8. $475, 9. $450, 10. $425, 11. $400, 12. $375, 13. $350, 14. $325, 15. $300, 16. $290, 17. $280, 18. $275, 19. $270, 20. $265, 21. $260, 22. $255, 23-30. $250; Tow $100. Thursday’s “A” Main – 1. $600, 2. $450, 3. $350, 4. $300, 5. $250, 6. $200, 7. $170, 8. $140, 9. $120, 10. $110, 11. $100, 12. $90, 13. $80, 14. $75, 15. $70, 16. $65, 17-30. $60. Friday’s “A” Main – 1. $750, 2. $500, 3. $400, 4. $350, 5. $300, 6. $250, 7. $200, 8. $170, 9. $130, 10. $120, 11. $110, 12. $100, 13. $95, 14. $90, 15. $85, 16. $80, 17-30. $75. Saturday’s “A” Main – 1. $1000, 2. $700, 3. $500, 4. $400, 5. $350, 6. $300, 7. $275, 8. $250, 9. $225, 10. $200, 11. $175, 12. $160, 13. $150, 14. $145, 15. $140, 16. $130, 17. $120, 18. $115, 19. $110, 20. $105, 21-30. $100; Tow $75 if raced all three nights. 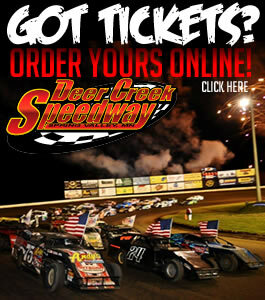 Fan may purchase tickets online at www.deercreekspeedway.com or by calling toll-free 877-DCS-RACE. For fans unable to attend the 18th Annual Featherlite Fall Jamboree in person, the entire event from the first lap of the first heat until the last checkered flag waves will be broadcast live via pay-per-view by RacinDirt.com. Expect dozens of driver interviews, profiles, special features, instant replay and more. Visit www.racindirt.com for ordering information. 1. 23 Adam Kates, Tonganoxie, Kan.
2. 59 Bob Sammann, Winona, Minn.
3. 49 Bob Timm, Winona, Minn.
5. 2x Brady Gerdes, Villard, Minn.
6. 50iii Brandon Davis, Medford, Minn.
7. 48 Brent Dutenhoffer, Watertown, S.D. 9. 6t7 Brian Albrecht, Winona, Minn.
10. 6 Brock Bauman, Eureka, Ill.
11. 97 Cade Dillard, Robeline, La. 14. 51 Chris Oertel, Marshfield, Wis.
15. 4 Cody Bauman, Eureka, Ill.
16. 07 Cory Crapser, Chippewa Falls, Wis.
17. 91 Craig Thatcher, Knapp, Wis.
18. 60 Dan Ebert, Lake Shore, Minn.
20. 23k Darwin Karau, Kasson, Minn.
21. 40 David Schuster, Waterville, Minn.
22. 20jr David Wytaske, Grand Meadow, Minn.
23. 4r Dereck Ramirez, Woodward, Okla.
24. 1a Dwaine Hanson, Lakefield, Minn.
25. 23k Erik Kanz, Winona, Minn.
26. 97 Greg Chesley, Duluth, Minn.
27. 21 Jacob Bleess, Chatfield, Minn.
28. 77 Jacob Stark, Austin, Minn.
29. 49jr Jake Timm, Winona, Minn.
30. 71 Jason Cummins, New Richland, Minn.
31. 12 Jason Hughes, Wellsville, Okla.
32. 5 Jeff Taylor, Cave City, Ark. 33. 55 Jeff Wood, Chisholm, Minn.
34. 55w Jeffrey Wood, Chisholm, Minn.
35. 89 Jesse Glenz, Cadott, Wis.
38. 91 Joe Duvall, Claremore, Okla.
39. 29h Joe Horgdal, Kasson, Minn.
40. 4a Joel Alberts, Kasson, Minn.
41. V2 Joey Jensen, Harris, Minn.
42. 9 John Carpenter, Hibbing, Minn.
43. 94jr John Doelle, Arcadia, Wis.
44. 1st Johnny Scott, Las Cruces, N.M.
45. 99 Josh Angst, Winona, Minn.
47. 98 Kevin Stoa, Albert Lea, Minn.
49. 17 Lucas Conley, Spring Hill, Kan.
50. 69 Lucas Schott, Chatfield, Minn.
51. 00 Mark Gartner, Mapleton, Minn.
52. 20m Mark Motl, Owatonna, Minn.
54. 18 Mick Glenn, Minnesota City, Minn.
55. 81 Mike Densberger, Lincoln, Neb. 57. 17 Mike Striegel, Wheatland, Mo. 59. 38 Rick Cannata, Hibbing, Minn.
60. 2r Rickie Roche, International Falls, Minn.
61. 20rt Ricky Thornton Jr., Chandler, Ariz.
62. 00 Robby Bunkelman, Abbotsford, Wis.
65. 53 Ronnie Woods, Mexico, Mo. 66. 1s Ryan Mikkelson, Jamestown, N.D.
67. 91 Scott Drake, Webb City, Mo. 69. 73b Shad Badder, Bates City, Mo. 70. 90 Steve Wetzstein, West Concord, Minn.
72. 2s Stormy Scott, Las Cruces, N.M.
73. 61t Tammy Clark, Rochester, Minn.
74. 75 Terry Phillips, Springfield, Mo. 75. 85 Thomas Tillison Jr., Wellsville, Okla.
76. 7s Todd Stinehart, Waseca, Minn.
77. 85 Tom Tillison Jr., Wellston, Okla.
78. 1sx Travis Saurer, Elizabeth, Minn.
80. 0 Adam Hensel, Baldwin, Wis.
81. 24 Brad Waits, Rochester, Minn.
82. 52w Nate Wasmund, Rochester, Minn.
83. 21t Lance Town, Louisburg, Kan.
84. 10 Austin Arneson, Fargo, N.D.
86. 02 Tommy Weder Jr., Woodward, Okla.
87. 29 Blonde Bomber Mitchell, Pea Ridge, Ark. 88. 29 Larry Campbell, Fort Smith, Ark. Drivers can enter by calling the USMTS office at (515) 832-7944. Race into the season with our SpeedWeeks Specials!